Ernie Nevers was born in Willow River, Minnesota, on June 11, 1902. 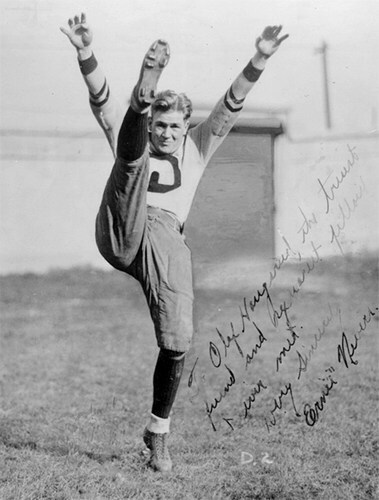 Nevers attended Superior Central High School where he led the football team to the 1918 Wisconsin State Championship. He then went to Stanford University where he became known as the “Big Dog,” and the “Blonde Bull.” He was an all-American on the gridiron at Stanford, where during the 1925 Rose Bowl he outgained all four of Notre Dame’s legendary “Four Horseman” playing both offense and defense during the entire game on two broken ankles. In 1926 Nevers’ high school teammate Ole Haugsrud recruited him to Duluth to play for the Duluth Kelleys, which Haugsrud renamed the Duluth Eskimos or “Ernie Nevers’ Eskimos” in a move NFL president Joe Carr said “saved the NFL.” That year Nevers led the Eskimos, played professional basketball in Chicago, and pitched in baseball’s major league. During the Eskimos storied 1926–1927 season, the Big Dog played all but 29 minutes of the 29 hours the Eskimos were on the field. The following year he also took over as coach, but the team had a miserable 1–8 record that year and, due to financial problems, the team folded the next year. In 1929 Nevers and eight of his Duluth teammates joined the Chicago Cardinals. During one game against the Chicago Bears, Nevers scored every point in a 40–0 victory—a record that still stands today. In 1932, Nevers moved back to California and assumed the position of backfield coach at his alma mater, Stanford. After four seasons, he moved east, taking over as head football coach at Lafayette College in Easton, Pennsylvania. After just one season there, he accepted an offer from his former high school coach, Ira Tubbs, and landed back near his Midwestern roots. He became the head backfield coach for the University of Iowa, where Tubbs was head coach. In accepting the job, Nevers said in an Associated Press interview he rejected “an attractive offer” from the NFL’s Cleveland Rams. The NFL beckoned again in 1939, and Nevers answered the call, taking over as head coach of the Chicago Cardinals. But when his team won only one game against ten losses, he resigned and returned yet again to Stanford. This time, though, he was a student, working to complete his physical education degree. World War II broke out, and even though he was thirty-eight years old—easily old enough to be excused from military service—Nevers volunteered. He signed up for the Marine Corps. He rose in rank to major while serving in the South Pacific as an ordnance officer in the 134th Torpedo Bomber Squadron. While overseas, his wife, the former Elizabeth Heagerty, died. The two had been married nearly twenty years, ever since 1926, the year they drove together from St. Louis to Two Harbors, Minnesota, arriving late for the Duluth Eskimos’ training camp. Soon afterwards, Nevers met actress Marjorie Luxem Railton on a blind date arranged by friends. He was so taken by her he proposed marriage that very night. Marjorie refused—she didn’t know who the Ernie Nevers was—but soon came around. A few months later, the two married and moved back to California where they settled in tiny Tiburon, an affluent town on the Tiburon Peninsula, which reaches south into San Francisco Bay. There their daughter Ernestine was born. Nevers then took his first non-football job, working in public relations and sales for Sobel Liquors, a wholesale firm. Nevers may have been ready to put football in the past, but football wasn’t ready to let go of him. In 1951, he was inducted in the College Football Hall of Fame. In 1962, Sports Illustrated magazine named Nevers the best college football player ever. In 1963, the same year he was inducted into the Pro Football Hall of Fame, Nevers was named to the NFL’s All-Time All-Pro Team. He was a member of the inaugural class of the Superior, Wisconsin, Athletic Hall of Fame in 1967. In 1969 he was named to college football’s All-Time All-American Team, as chosen by the Football Writers Association of America. That same year Nevers was enshrined in the Duluth Arena Sports Hall of Fame with his former Eskimos’ teammate Wally Gilbert. Nevers died of kidney disease on May 3, 1976, in San Rafael, California. He was 73. In his final days, he was “in terrible pain,” his wife would say when her husband was inducted posthumously into the San Jose Sports Hall of Fame.